Performance tandem Costantino Zicarelli and Angelo V. Suarez continue their investigation of space and language in their first two-man show together, "The Suarelli Brothers Have Nothing to Do w/ Each Other." 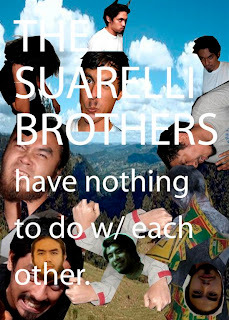 Billed as siblings whose surname is a conflation of their actual surnames, Zicarelli and Suarez pair up to both interrogate and celebrate the inherent violence of pairing: How do two things that have nothing to do with each other -- or people, such as themselves -- come together? The primary aesthetic (one can almost say ethic) or technique that is apparent is juxtaposition: image against image, person against person, praxis against praxis, system against system, structure against structure. While the two profess no particular allegiance to the Surrealist movement, one cannot help but be reminded of the line by Le Comte de Lautreamont (considered a precursor of Surrealism) in this emphasis on the notion of encounter: "Beautiful as the chance meeting of a sewing machine and an umbrella on a dissecting table." True to their backgrounds, the artists engage the media that are most familiar to them and they have become known for. 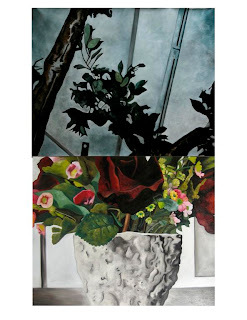 Zicarelli, for instance, in his focus on painting -- with three well-received solo exhibitions under his belt -- makes use of large diptychs as a formal strategy for interrogating couplings as varied as the somber and the absurd, the clinical and the gritty. Suarez, on the other hand – with three published books to his name -- makes heavy use of words, finding possibility for poetry that engages the site and materials it inhabits, from photography as a means for documentation to mail not just as medium for correspondence but as correspondence in itself. The exhibit runs until August 21, 2009.